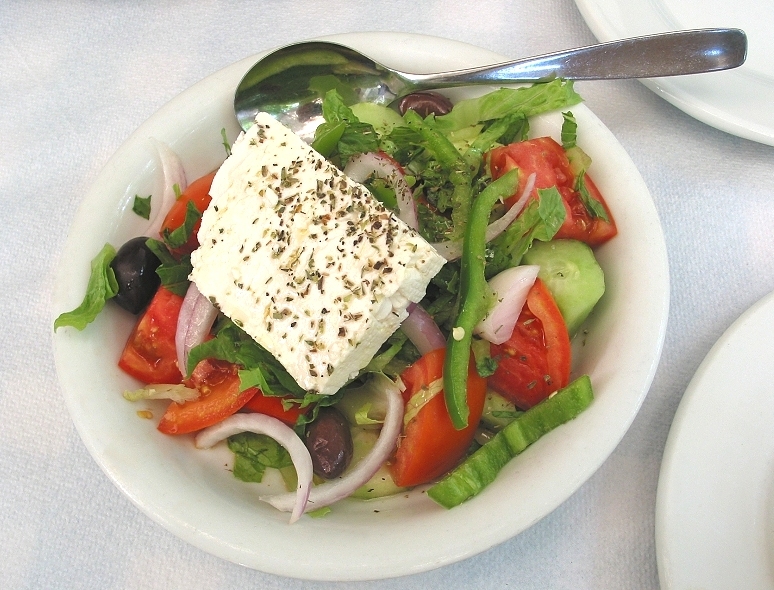 Greek salad, sometimes described as 'country/village/peasant salad', is a common component of a Greek meal. Greek salad is made with wedges of tomatoes, sliced (and, typically, peeled,) cucumber, green bell peppers, red onion, sliced or cubed feta cheese, and kalamata olives, typically seasoned with salt, pepper and dried oregano, and dressed with olive oil. Common - optional - additions include the pickled leaves, buds or berries of capers (especially in the Dodecanese islands), vinegar and chopped parsley.